For Nicole Knape ’19, a native of Raleigh, North Carolina who recently finished her coursework for medical school, completing pre-health requirements has been a time-consuming and challenging task. Knape, who took the Medical College Admissions Test on March 24, intends to proceed directly to medical school following her graduation from Dartmouth. Knape started her pre-health requirements “right off the bat” during her freshman fall, and has completed at least one, if not two, required courses during each of her terms at Dartmouth. Despite the challenges associated with preparing for medical school, Knape, a neuroscience major and global health minor, has enjoyed her pre-med preparation and is thankful for the opportunities that Dartmouth has provided. Emily Yang ’18, a biology modified with anthropology major from San Diego, California, has likewise enjoyed her pre-health preparation at Dartmouth and looks forward to medical school. She intends to take a gap year before matriculating, which has become increasingly common nationwide among pre-health students. Similarly to Knape, Yang acknowledges that the pre-health curriculum is challenging, but said that pre-med students have bonded over their coursework. Knape agrees that the pre-med community is tight-knit and said that students are willing to work together. One nostalgic and somewhat disappointing aspect of the pre-health path is that many students decide to leave the pre-med or pre-health track along the way and pursue other interests, Yang added. After she earns her medical degree, Yang hopes to become a primary care doctor with a focus on pediatrics or geriatrics, because she recognizes that the need for primary care physicians is high. According to a 2017 report by the American Association of Medical Colleges, there will be a lack of 7,300 to 43,100 primary care doctors by 2030 as America’s population continues to grow and increase in age. An internship at a primary health and homeless clinic for underinsured patients in San Francisco solidified Yang’s interest in primary care. She runs a sub-club within Dartmouth’s Nathan Smith Society, a student organization that provides resources and programming related to the health professions, that focuses on giving primary care to patients at the Good Neighbor Health Clinic in White River Junction. In addition, Yang has performed other volunteer work and conducted research on topics such as tumor suppressor genes and the purported link between circumcision and breastfeeding at Geisel School of Medicine. She encourages students who are interested in medicine or other health professions, such as veterinary medicine or dentistry, to determine what makes them passionate about those fields and then to focus on those interests. Knape loves volunteering at Dartmouth-Hitchcock Medical Center and feels that her time spent in the hospital has motivated her to continue pursuing her medical aspirations. Yang has found one of the most stressful aspects of applying to medical school, which is a year-long, highly competitive process, to be the realization that it is the culmination of her time at Dartmouth. “Experiences that I’ve poured over for four years become a paragraph on my application,” she said. Knape has struggled at times to grapple with her own high standards. “Setting high expectations for myself has been challenging, and it can also be incredibly stressful to think about how every grade on a test impacts my [potential admission to] med school,” she said. Erin Kawakami ’21, a first-year student from Palos Verdes Estates, California, intends to complete the pre-med track during her time at Dartmouth. Kawakami does not know what major she intends to pursue because it will be distinct from her pre-health requirements, but she is interested in several academic disciplines, including engineering, psychology, anthropology and human-centered design. Kawakami said that her long interest in medicines stems from her “passion” for sports. She enjoys learning about medical problems and their causes and is fascinated by anatomy. She also enjoys helping others. The emphasis on GPA in the medical school application process concerns Kawakami because pre-health courses are notoriously rigorous. Kawakami is also concerned about the possibility of not making the best use of her time at the College if her interest in medicine changes, but she finds the possibility of becoming a doctor to be appealing after many years of schooling. She has found the pre-health advisers to be really helpful. Kawakami has to juggle her pre-health requirements with her commitments as a member of the women’s varsity soccer team, but she said that doing so has been “manageable” so far. 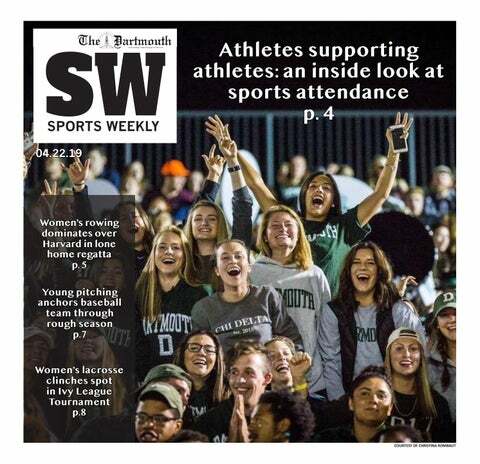 Yang and Knape do not participate in varsity sports at Dartmouth, but they are both undergraduate advisers. Knape believes that, even though pre-med has been rigorous and challenging, all of her efforts have been worth it. She looks forward to attending medical school and becoming a doctor, but hopes to enjoy her upcoming senior year at Dartmouth College in the meantime.